Last year UCDSystems requested a couple banners for the Milipol Qatar and Dubai. They changed the name of their product from Under Car Detection System to Vehicle Inspector. Milipol in Paris is held on the 21 – 24 November 2017 and the Vehicle Inspector will be displayed there. I’ve been asked to design a product brochure, a couple of techsheets and new banner of ca. 3m x 3m meters. 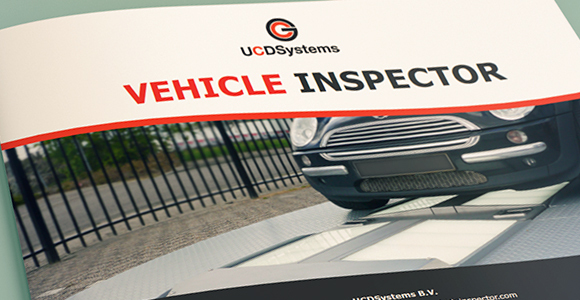 Last year I developed the Brand design for the Vehicle Inspector marketing products. This time I continued to explore other possibilities to refine the Brand design. The product brochure contains 20 pages, including the front cover and backside. The brochure is available in Dutch, English and Polish. Not only I designed the brochure, I edited most of the content too. Photo’s that required a face-lift? No problem.